Up for auction is a hand signed Luke Kuechly football card. This card comes from my Personal Collection. You will receive actual card in picture This is a great hand signed card. Ships to the United States by USPS only. If you have any questions feel free to ask thank you for your interest. DOESN'T INCLUDE SETS OR TEAM SETS! Just type in your favorite Team or Player and it will show you all I have. GOOD LUCK! (03)-033 Luke Kuechly. (07)-258 Luke Kuechly AP. (10)-387 Luke Kuechly 60. These contain all base & rookie cards for the team listed (1-500). Cards average NrMint condition - Included players listed below. (01)-013 Luke Kuechly. These contain all base and rookie cards for the team listed (1-222). 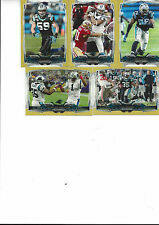 Cards average NrMint condition - Included players listed below (02)-025 Cam Newton. - We always provide exact players & card numbers to eliminate any doubt. LUKE KUECHLY. CAMO REFRACTOR. Sports Card deals! High quality photos of cards. 272 Luke Kuechly. 286 Luke Kuechly. 159 Greg Olsen. If you win more than 1 different item, wait for my invoice! Set Contains 146 Carolina Panthers Team Card. 45 Cam Newton. 409 Kelvin Benjamin RC. Player: Luke Kuechly (RC). Team: Carolina Panthers. Subset/Parallel/Product: Rookie Auto. Attractive Card. Condition: This card is in NM-MT shape or Better. (13)-433 Luke Kuechly (Rookie). These contain all base & rookie cards for the team listed (1-440). 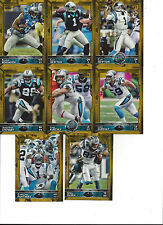 Cards average NrMint condition - Included players listed below (07)-282 Carolina Panthers. (03)-141 Cam Newton ROY. An exquisite selection of football treasures! Where you'll always find exquisite value, exquisite quality, exquisite service and. Autograph in Blue Ink. No Jersey Patch. 10 #272, 10# 286 Topps and #95 Inception. All cards listed are in near mint to mint condition unless noted otherwise. I combine shipping on additional items purchased @ $0.25 per item and $0.50 per lot, so check my other cards. The more you buy at once, the more you save on shipping costs. If you do buy multiple items, please request an invoice and wait for me to send it before you pay. Thanks for looking and Happy Collecting! If you have any questions on my listings, feel free to contact me via ebay message and I will get back asap. FOR SALE IS A VERY NICE CARD AS YOU CAN SEE PICTURED IN THE SCAN. #26 LUKE KUECHLY. PINK REFRACTOR BASE PARALLEL CARD. (02)-026 Luke Kuechly. These contain all base and rookie cards for the team listed (1-200). Cards average NrMint condition - Included players listed below (01)-020 Cam Newton. - We always provide exact players & card numbers to eliminate any doubt. 2015 Topps Museum Collection #94 Luke Kuechly (Carolina Panthers)!!! Look!! What a great card of this superstar. 2012 Topps Finest Luke Kuechly Rookie!! #139 (Panthers) Look!!! Hot!!! 2012 Topps FB HOBBY Pack Andrew Luck Russell Wilson Luke Kuechly Rookie RC? Luke Kuechly, RC. Andrew Luck, RC. Robert Griffin III, RC. Ryan Tannehill, RC. Kirk Cousins, RC. Kam Chancellor, RC. T Y Hilton, RC. Alshon Jeffrey, RC. 2012 TOPPS PLATINUM #137 LUKE KUECHLY PSA GRADED MINT 9 Lot (2) X-Fractor, Base. Condition is Like New. Shipped with USPS First Class Package. CARD NUMBER: RA-LK. GREAT AUTOGRAPHED ROOKIE CARD TO ADD TO YOUR COLLECTION.